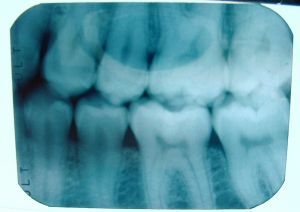 Dentist Woodstock: How Much Do Dental X-rays Cost? If you are a new patient, in our Sandy Springs office we have to take x-rays as the standard of care to determine the present status of your oral health and to help identify changes that may occur later. They give your dentist a baseline of your present condition. A new set of x-rays may be needed to help detect any new cavities, determine the status of your gum health or evaluate the growth and development of your teeth. If a previous dentist has any radiographs of you, your new dentist may ask you for copies of them. Finding and treating dental problems at an early stage can save time, money and unneeded discomfort and help prevent more serious health problems. A good dentist will tailor a treatment plan to your finances, altering the ideal treatment as much as possible to help you be able to afford it. If we can be of help, please do not hesitate to contact us to make an appointment to be seen.